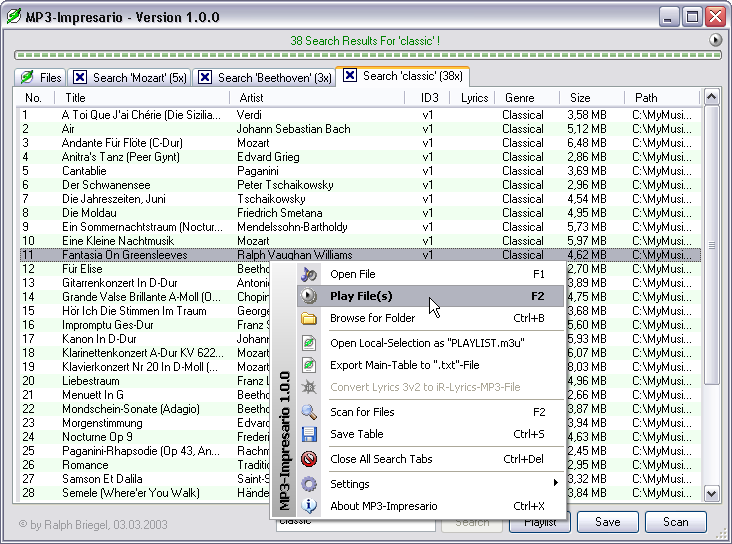 MP3-Impresario is an MP3-archivist, analyser, converter, playlist generator, player, etc. Scan for MP3 files in custom folders & subfolders. Analyse MP3 files & show lyrics-type, genre, filesize, ID-Tag-Version & more. Export table to textfile. Generate custom m3u-playlist and open it automatically with your default audio player or play files directly with the integrated player. Convert your MP3 file with Lyrics3v2-Tag to a file with iRiver-Lyrics support. 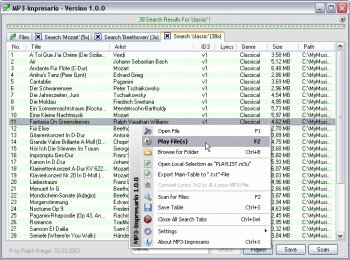 Drag & Drop files from table to your Winamp Playlist. Search & powerful sort-function included.